The Difference Between A Pyramid Scheme And Multi-Level-Marketing? Last updated on May 22, 2017 By Nat 4 Comments This post may contain affiliate links. We appreciate you supporting Rags To Niches! Full disclosure here. Commonly, multi-level-marketing businesses, (MLM’s) are put under the spotlight and judged to see if they’re actually Pyramid schemes in disguise. Many MLM’s have been shut down, because they are revealed to be Pyramid Schemes and therefore, illegal to run. There are also groups of people that believe that ALL MLM’s are actually Pyramid schemes – is there any truth in this? 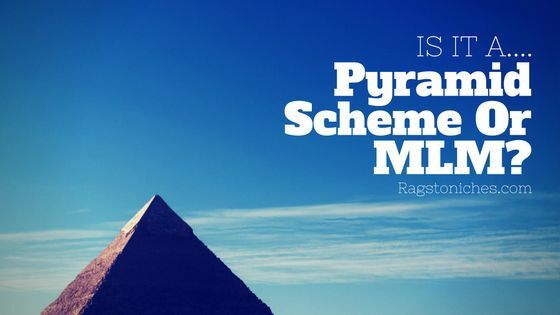 What Is A Pyramid Scheme & How Do They Work? The creator sits at the top of the pyramid and recruits others below him. Each of these recruits will make a payment to him, in order to join the scheme. The recruits will be promised a very good return on their investment. The people he recruits will then need to recruit several others below them, in exchange for a fee and some of this will also go to the original investor. The next level of recruits also recruit more people and again, a percentage of the money will filter back up into the higher levels. So, the person at the top of the pyramid will receive a percentage from all the levels who join below him. 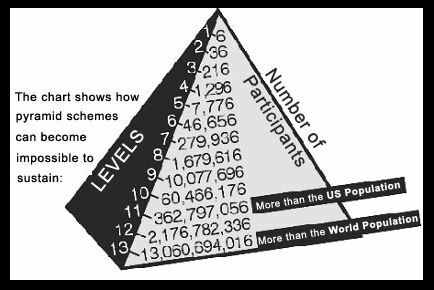 Ultimately, the more levels that are added to the Pyramid, the lower the return. Eventually, it gets to the stage where no new recruits will buy into the Pyramid scheme and this is the point that the Pyramid scheme collapses. This is the stage where the last recruits that came in, will not make a return on their initial investment. It’s suggested that around 90% of people who invest in a Pyramid scheme, will lose their money. Do Pyramid Schemes Sometimes Have Products In Exchange For Money? Traditional Pyramid schemes generally do not involve any tangible products nor services, it will just be money being exchanged. If they do include products, they’re generally not the kind of thing you’d buy if you were outside the scheme. For example, they may take the form or files or reports and would only be bought by the people wanting to invest in the scheme. There are now also variations on the traditional Pyramid scheme, which are generally just a way to avoid being classed as one. It’s not a great disguise however, because it’s clear once you look into the schemes that these are not “donations,” or “gifts,” being exchanged – everyone putting money in, is expecting more money out in return. To the point where only the people within the MLM are actually purchasing the products. So, What Is The Difference Between A Legal MLM Business And A Pyramid Scheme? In a legal MLM there must be customers that are not part of the compensation plan. It’s important to know what percentage of people buying the products are actual customers with no ulterior motives and this can often be difficult to distinguish. Many MLM companies will have a product, but is not a product of real value and in this scenario, you could arguably call it a Pyramid scheme. If no one external to the MLM is actually buying the products, or if this a small percentage, then this is a big warning sign that it is a Pyramid Scheme. Legal MLM’s should focus primarily on the sale of their products or services and not on recruiting others into the business. If you go to a seminar for an MLM and all they’re talking about is how you can progress through building your team and largely focusing on wealth – this is something to be extremely wary of. Illegal schemes, (or even legal MLM’s than have not yet been revealed to be Pyramid Schemes) will always focus on recruitment as their #1 priority. The products you’re told you will be selling, should also be of similar value to products you could buy yourself from a regular store. Some MLM’s will get away with this on some level, by trying to say their products are more high-end products and therefore legitimately high priced. For example, I recently wrote about the MLM Pampered Chef – and while their products are on the pricey side, they could be comparable to other higher end products of cookware and are good quality. On the other hand, many health and wellness products sold by MLM’s have been criticised for being grossly overpriced and are arguably not better quality than a lot of cheaper items you can find at a regular store. A legal MLM should have low start up costs – whereas Pyramid schemes tend to have a larger sum you have to pay upfront, (this is not always the case however!). A legal MLM should also have a money back guarantee of some sort, whereas this will be a rarity with an illegal Pyramid scheme. So, Why Do Some Believe All MLM’s Are Scams? There are various reasons why some people claim that all MLM’s are really nothing but scams in disguise. Primarily focusing on recruiting others, above the actual sales of their products. Lots of hype about the business and how much wealth you can achieve – which is far from the reality for a huge majority. Having overpriced products, that are no better than much cheaper ones in the market. At times, having outrageous and unsubstantiated claims about the effectiveness of their products, (e.g. in the health and wellness niche). I believe the key reason that some people believe that all MLM’s are scams – is that many focus on recruiting others, above directly selling products. There is often also a lot of hype surrounding MLM’s – marketing will focus on how you can live the dream, quit your day job and gain financial freedom. When, the reality behind MLM’s, is that a majority that join will never achieve any success at all. You can see the facts in their income disclosures, (when they provide them) and see that the reality behind having an MLM business is vastly different to how they normally portray it to be. There is a significant gap between how an MLM business will sell their “opportunity,” and the actual reality behind success rates, which is highly deceptive. What’s more, they often create a cult-like community that are manipulated into feeling that they are part of something really special and that they are special for being a part of this business. It creates groups of individuals that fiercely stand up for the MLM model – or their business, which they may claim is somehow “different, ” to other MLM businesses. Is Being Involved In An MLM Really The Same As,”Having Your Own Business”? MLM’s will often argue that being a part of an MLM, is your opportunity to build your own business and financial independence, so that you won’t be a slave to the system anymore. But, from some peoples perspective, being involved with an MLM just means you are just a slave to another system. You do not own the brand, you won’t own the website, (if provided), you don’t create the products, you don’t have any power over the business and if the MLM collapses, your business will be over. So, while you could say you are running your own business, in a sense, you are still very much working for someone else. Conclusion: Are All MLM’s – Just Pyramid Schemes? While I do have sympathy for the argument that MLM’s are really just legalised Pyramid Schemes, I don’t think all MLM’s can yet be classed as such. While they are very few and far between, some MLM’s have decent products that are sold independently and sometimes people make reasonable money from selling products alone, without the need to recruit others. That being said, within any MLM, those people will be rare and most will be making a part time wage from their efforts, rather than a full time income. There are also some MLM’s that do not have the hype that many of them seem to adopt and may openly declare that they are largely a part time business opportunity, rather than a way to quit your 9-5 job. Some MLM’s also certainly focus primarily on products and not just on getting people to recruit – although, in my experience, that is unfortunately uncommon. Ultimately, I don’t think MLM’s are a good business model and they are largely flooded with hype, false promises and deception. Many MLM’s could arguably fall under the label of a Pyramid Scheme, under close inspection. If Not MLM – Then What? When I first came online looking for ways to make money, I almost signed up to various MLM’s. But ultimately, after doing my research, I realised that there was a lot of hype and not much substance – I didn’t like the idea of trying to rope my family and friends into my business either, or relentlessly being on the hustle for new recruits. I decided to go with learning affiliate marketing instead and it’s how I made my first sales online. I remember my very first sale was via the Amazon associates program and it was for a kids toy I’d written a review on – I didn’t have to deal with payment, shipping or customer service, yet I made a commission. It wasn’t quick, nor easy, but I did it on my own terms – it’s also incredibly low-cost and low-risk. You don’t have to deal with direct sales, holding inventory, taking payments, customer service, or returns – which are all things that appealed to me. 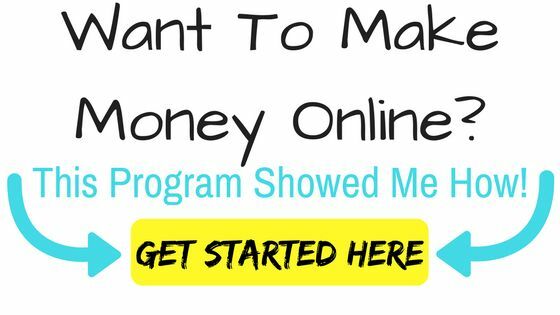 If you’re interested in trying something aside from an MLM, check out this program for affiliate marketing training, where you can start for free. Have you ever got involved in an MLM? Let me know in the comments! A lot of network marketing companies do have issues and there is a large failure rate – so be careful doing your research before joining one. I was once part of a legit MLM business. The only reason that I can say that it is legit, is because to this day that company is still existing. I am glad to have had the experience of been part of it, however, I say with confidence that the lion’s share of the profit is in the recruiting part. Even though the products were good, they were expensive and if you could sell huge volumes, then you would make good returns. The problem is that the niche for these products is within a saturated market.So, people could settle for cheaper alternatives. This means to survive the MLM, I had to focus on recruiting and that was not easy. I learned from your article exactly how pyramid schemes work and can see the fine line. between it and MLM. Nevertheless, I have the drive in me to work hard and tackle something that does not involve any recruiting. You mentioned affiliate marketing and that sounds really interesting. Does one need to have experience in marketing to try out this venture? Thanks so much for stopping by and sharing this story. There is a fine line between some MLMs and Pyramid schemes and I see you mention that the business you worked for was legit, because it’s still running. But some MLMs can run actually for decades, before eventually being revealed to be little more than recruitment schemes. Like you say, it’s common the products are too expensive, so it’s hard to sell them as stand alone products in an over saturated market. Affiliate marketing is preferable, because it doesn’t on bringing anyone into your business and you do not have to rely on anyone below you being successful. The best type of affiliate programs are ones that you get ongoing commissions though, rather than a one of sale. This is usually in the form of promoting membership programs – which you can find in many niches online. However, people do very well over just selling one off items, such as via amazon and so on. I wrote a post here about making your first affiliate sale online. You don’t need marketing experience to start in affiliate marketing and all and you can learn that as you go, but it would be an advantage!